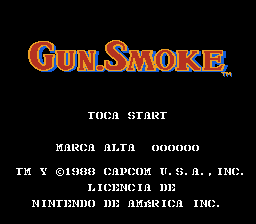 Gun.Smoke is an action shooter game for the Nintendo Entertainment System, which had nothing to do with the classic tv show. 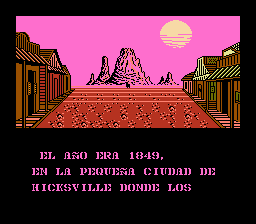 In this game, the player controls a bounty hunter whose mission is to free Hicksville from the Wingate gang. Pressing B will make the cowboy shoot to the left of the screen, pressing A will make the cowboy shoot to the right, and push both buttons will make the cowboy shoot straight ahead. 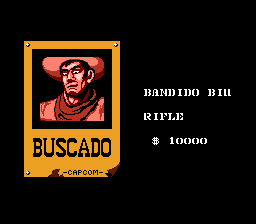 In order to make the boss to appear, the player must purchase a wanted poster from one of the villagers. 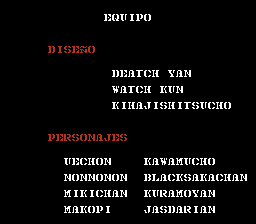 New weapons and a horse are also purchasable from the villagers. After defeating a boss, their wanted poster gets plugged with tons of holes. 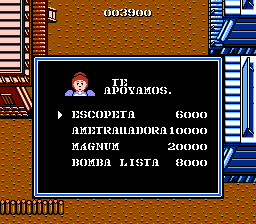 Translation to Spanish for “Gun.Smoke”, for the NES.